Buying a carpet is a big decision as it has to suit the budget and requirements of the house. But once you buy it, it has to be well-maintained to keep it safe and clean. If you live as a family with children, the first thing to get soiled and dirty is the carpet. 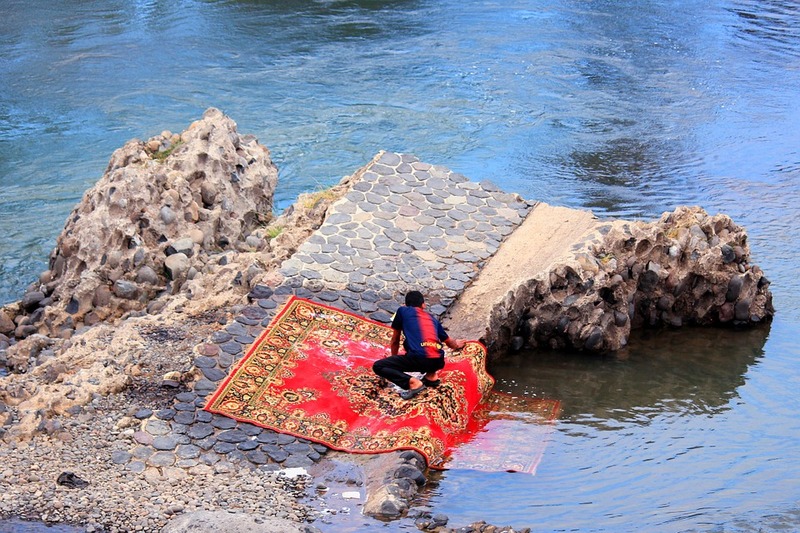 Carpets get soiled in many ways. There is a tendency for things to spill by accident and stains to form, at the most obvious areas. The dirt from the bottom of the shoes may get stuck on the carpet; pet may poop on the carpet even though they are well-trained, coffee may accidently fall on the carpet and the list will go on. Well! Accidents do happen and they have to be addressed. Carpets can be cleaned by hand or by carpet cleaning machines to solve all types of mess, on the carpet. Carpet cleaning is essential for a healthy atmosphere. Carpets can be washed by taking them out in the sunshine, beating out the dust and grime and then giving it a good wash and left in the sun to dry. However, if the carpet is too big, this process may not be possible. Washing the carpet can either be done for the entire carpet or it can be washed only in the most used areas. Care should be given to help the carpet dry up fully to enjoy the best benefit. Carpet shampoo can be used as a solution along with water to wash the carpet. Hard brush can be used if the carpet can stand the brush. A carpet shampooer can be used to clean the carpet. The built-in heating will help in the cleaning process. Stains can be removed using shaving cream by applying them directly on the stain. The shaving cream can then be removed with a white cloth and then patted dry. White vinegar helps to remove stains. White vinegar has to be mixed with equal amount of water while cleaning. The area should then be wiped with a cloth. Dishwashing liquid can be used to wash up grease and other oily content. It should be mixed with water and sprayed on the stain for best effect. Washing the carpet makes it wet. It should be dried properly to avoid mold and other growth that will result from a wet carpet. Dry carpet cleaners help to clean the carpet easier ad they can just be vacuumed. There is no necessity for drying it. Carpet cleaning machines will help in cleaning up all types of messes easily. Cleaning the carpet should be done frequently. While cleaning, the stains should be blotted and not rubbed. The blotting should be done from the outside and worked inwards. This will help in preventing the stain from spreading outside. Vacuuming is the best method of cleaning the entire carpet. This should be done regularly. Powder can be applied all over the carpet and left to stay. It can stay for at least half-an-hour or for a few hours. If left overnight, it would be better. The powder will soften the stains and remove bad odor. The powder can then be vacuumed up when you clean it. For pet poops, there are several organic cleaners available that can be used, instead of using chemicals. The cleaner spread out should then be wiped with a cloth. Sometimes, it should be slightly scrubbed to make it go away. If there are children in the house, there are chances of getting candy stuck up in the carpet or spilt on the carpet. It can be scrapped away with a knife and then a solution of slight soap and water can be applied and sponged away. Bissell Spotbot Pet does the job easily as it is a frequent job when it there are children around. Steam cleaning is one of the best way to deep clean the carpet. It can be done using cleaning solution that is pressure injected so that it spreads deep into the carpet. Once this is done, the machine removes all types of dirt and grime form the carpet. It will remove all types of oil and grease too. This should be regularly done at least twice a year, to keep the carpet clean and healthy. Deep cleaning at home can be done using salt, borax and white vinegar of equal measure. This should be made as a paste and applied on all portions that have deep stains and oiled section. Allow it to sit for a few hours, till it dries up. Then it can be vacuumed away. You can use the steam cleaner too. Carpet cleaning machines are very useful to help in deep cleaning of the carpets. Cleaning the carpet is tedious work. But the carpet has to be kept dirt-free to have a clean house. To have a clean carpet, the carpet should be vacuumed regularly, particularly in the entrance area and in the high-traffic areas. This can be done at least twice week. The rest of the carpet should be cleaned up at least once a week. This will help the carpet from attracting too much of oily substances, grease and soil build-up. Having a Hoover SteamVac carpet cleaning machine will make the process much easier. There are several brushes that can help in cleaning it up easily. The machines come with various products such as brush, cleaning material and solution, etc., which makes cleaning easy. The machine can be bought or can also be hired it cannot be afforded. Using a carpet cleaning machine is very easy to use and light to carry. It makes the entire process less troublesome. With various models available, you have to choose them according to your need and according to your budget.